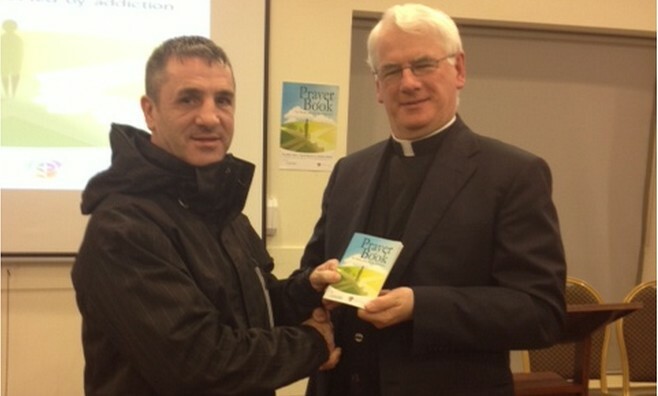 Thank you for the invitation to launch this Prayer Book for those affected by Addiction. It is beautifully produced. It incorporates prayers and images both old and new and spans the religious sentiments of older and younger generations. This booklet is, as Bishop Eamonn Walsh writes in the introduction (p.3) “a resource to give hope, support, the will to carry on to those struggling with addiction”. It is also offered as a resource and support to their families and friends. This booklet, compiled by John Taaffe, national Co-ordinator of the Irish Bishops’ Drugs Initiative, is the product of an initiative and service imagined and developed by the Irish Bishops’ Conference in response to addiction to drugs and alcohol on the island of Ireland. In October 2008 I had the privilege of being involved in the launch of the Irish Bishops’ Drugs Initiative (IBDI) entitled, “Alcohol-Drugs parishes Respond”. As I prepared for that event, within months of my return to Ireland, I chanced to invite a conversation on the subject of addiction with the priests of one of our vicariates or region of parishes. Struck up without any fore-warning, that exchange highlighted for me in a dramatic way the raw, hard and daily reality of alcohol and substance abuse in the community across all age brackets, across the socio-economic strata, and indeed across confessional boundaries. I was amazed at the immediate and automatic command of detail, whether of statistics, substances, initiatives and responses by public and private sectors, by those priests, evidently confronted daily in their work and ministries with addiction and its effects on family, relationships and society. There can be no doubt : surveys, research and above all daily experience tell us that addiction to drugs and especially misuse of alcohol are major problems in our society. This booklet is an instrument and a resource of spiritual and religious hope and strength for all who have struggled with addition whether directly or indirectly. Within its forty pages this pocket-size booklet contains prayers and citations from the Bible, from Old and New Testament. It is attractive and user-friendly. It can be used by everybody. It will assist those of us with addiction problems to overcome the sense of spiritual separation and disconnected-ness from self, from others and from God. For others it can serve to mobilise solidarity in action to help tackle the issue of addiction. The Prayer Book is Catholic in inspiration and evidently so in the prayers, references and images included. It also includes a prayer that pre-dates the Reformation, the Prayer of St Francis, and is common to all Christians. It includes citations from the representatives of the Reformed tradition of our Christian faith and from William Penn representing the Quaker tradition. Life is like a voyage on the sea of history, often dark and stormy, a voyage in which we watch for the stars that indicate the route. The true stars of our life are the people who have lived good lives. They are the lights of hope. Certainly, Jesus Christ is the true light, the sun that has risen above all the shadows of history. But to reach him we also need lights close by – people who shine with his light and so guide us along our way. These lines touch on the core of the Christian tradition – God at work in the human realm, and on the frightening and dark hillside of Calvary – the principle of the incarnation, God in the human flesh and blood in Jesus of Nazareth who in his Passion entered the dark realms of suffering and torture and on Easter Sunday was raised from the grip of death and gave New Hope, a new Hope and a new Life, to humanity, to us, through faith in Jesus Christ. This booklet is therefore a rich and sparkling mosaic containing prayers from the Bible, from the Christian tradition of prayer and reflections on human experience – these prayers and reflections put at the service of all. It is rooted in the proven insight that religious faith is a vital element, indeed a transformative element, in addressing the trials of life, including addictions. Some basic statistics for Northern Ireland show the timeliness of this Prayer Book and the initiative being taken here in All Saints, Ballymena. In 2010/2011 there were over 12.000 acute alcohol related admissions. Misuse of alcohol causes 5 deaths per week. It is a contributory factor in at least 50% of all suicides and a major causal factor in 63.8 % of all episodes of self-harm. Our consumption patterns and habits are problematic: 4 in 5 adults exceed recommended daily limits and younger adults (18-29) are more likely to exceed weekly guidelines. Some 40,000 children in Northern Ireland are adversely affected due to misuse of alcohol by adults. These and other pertinent statistics are available in such documents as, Adult Drinking Patterns in Northern Ireland, published by the Department of Health, Social Services and Public Safety and the Report Alcohol in Europe presented to the European Commission in 2006. The Irish Bishops’ Drugs Initiative is a response to addiction. More precisely it is a vehicle to help communities, parishes, individuals to help themselves. It recognises that intervention, though it benefits from and requires assistance from various sectors, is most effective when grown – of course in partnerships – from the grass-roots and locally. The initiative involves some 1,000 volunteers and some 250 parishes island wide. It is a cross community project, involving the faith community, the public and private sectors. And what is most important it empowers communities, families and individuals to come together to tackle addiction, be it to substances or alcohol. I compliment John Taaffe on this Prayer Book which we launch here this evening. I wish to salute the presence among us of representatives of the statutory sector, representing such agencies as, the Hope Centre, Threshold and the Naomi Centre. Your work of vital significance for the well-being of both individuals and of society and I thank you for your dedication and professionalism. This evening I also wish to congratulate you all here at All Saints, and in particular Fr Patrick Delargy, Parish Priest, for initiating a pilot project here in Ballymena. I am sure it will bear much fruit, personal, familial, social and spiritual for many in the years ahead.